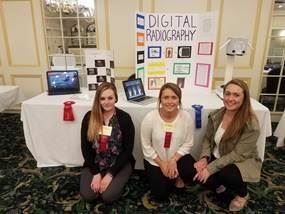 The MSRT is now accepting applications for student representatives from each Medical Imaging Program in Maine. The Application Deadline is October 15, 2018. Two of the MSRT student representatives will be chosen to represent Maine in the ASRT Student Leadership Development Program which includes an all-expenses paid trip to Orlando. Student Exhibit Contest Information for 2019 is coming soon! Congratulations to Adèle Cvetkovski and Jennifer Brown! Adèle and Jennifer have been selected to represent Maine in the ASRT 2019 Student Leadership Development Program (SLDP). They will received an all-expenses paid trip to Orlando, Florida to attend the 2019 ASRT Educational Symposium and Annual Governance and House of Delegates Meeting, June 20-23. They will be given an insider’s look into the American Society of Radiologic Technologists, have access to expanded opportunities for professional growth, and three years of continuing SLDP opportunities.